This toolkit addresses how LGBTQ parents and guardians can play a key role in creating safe and inclusive spaces in their school environments. Safe and inclusive schools are a top priority for LGBTQ parents. While many families have positive experiences in schools, far too often children and their LGBTQ parents experience bullying and marginalization. 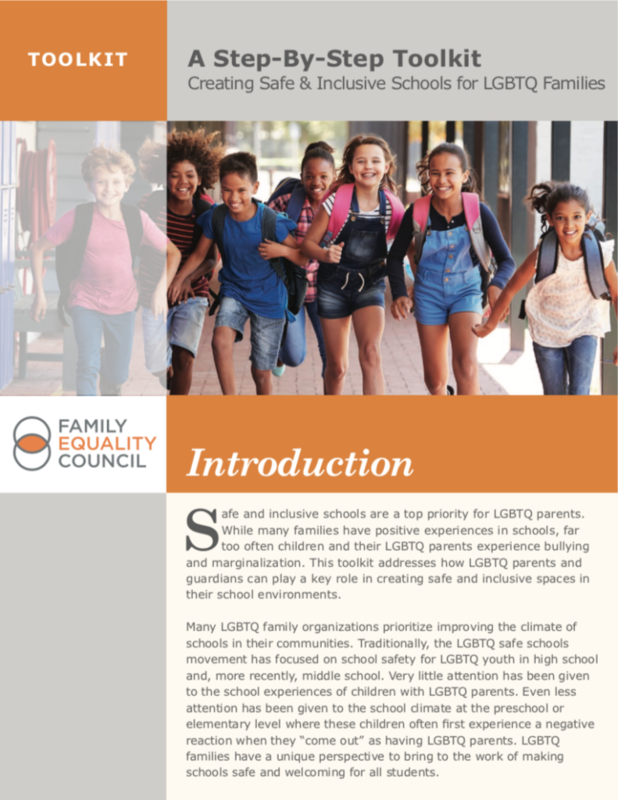 This toolkit addresses how LGBTQ parents and guardians can play a key role in creating safe and inclusive spaces in their school environments. Many LGBTQ family organizations prioritize improving the climate of schools in their communities. Traditionally, the LGBTQ safe schools movement has focused on school safety for LGBTQ youth in high school and, more recently, middle school. Very little attention has been given to the school experiences of children with LGBTQ parents. Even less attention has been given to the school climate at the preschool or elementary level where these children often first experience a negative reaction when they “come out” as having LGBTQ parents. LGBTQ families have a unique perspective to bring to the work of making schools safe and welcoming for all students.